If you are chomping down on a piece of toast while walking out the door in the morning, then you, my friend, are definitely starting the day on the wrong foot. A McDonald’s Deluxe Breakfast should never replace a healthy arrangement of eggs, bacon, pancakes, fresh fruits and freshly-squeezed orange juice. Breakfast time is to be enjoyed in all aspects of taste, smell and atmosphere. With a new year just around the corner, you are probably reflecting on all the accomplishments you achieved in 2013 and jotting down some aspirational resolutions for a brand new start. I hope you listed “have a breakfast of champions every morning,” as one of your top three goals for 2014! Getting up early and taking extra time to arrange an epicurean feast is not an easy feat. 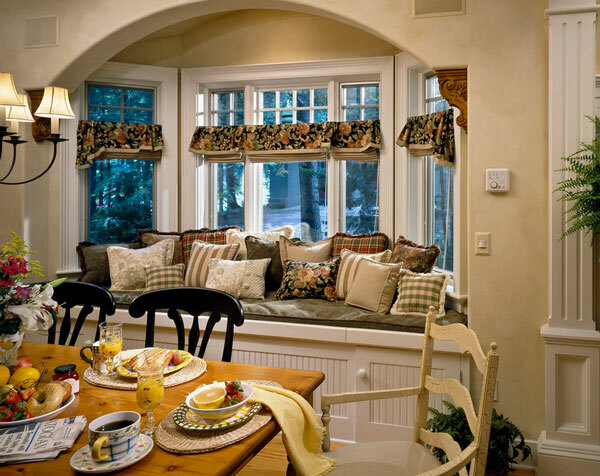 Perhaps a cozy, inviting kitchen nook can swing you in the right direction. 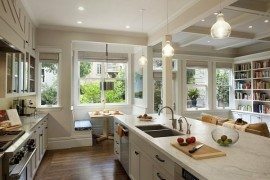 The distinct theme of kitchen nooks welcomes a breath of fresh air into a setting that might have lost its attractiveness and importance. 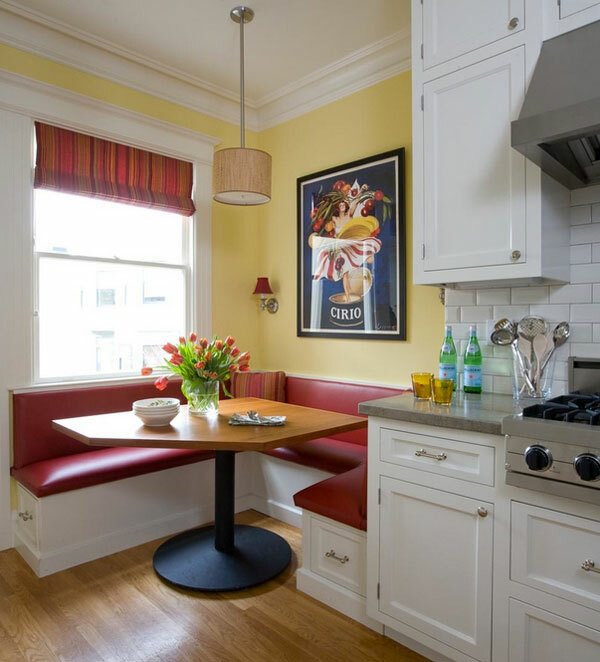 Nooks can transform the conventional kitchen into a stunning venue and display of nostalgic design and old Hollywood charm. Whether you believe it or not, we all have a soft spot for granny’s colorful patchwork quilts, thick and melt-in-your-mouth chocolate chip cookies, butterscotch hard candies and peculiar collections of antiques. 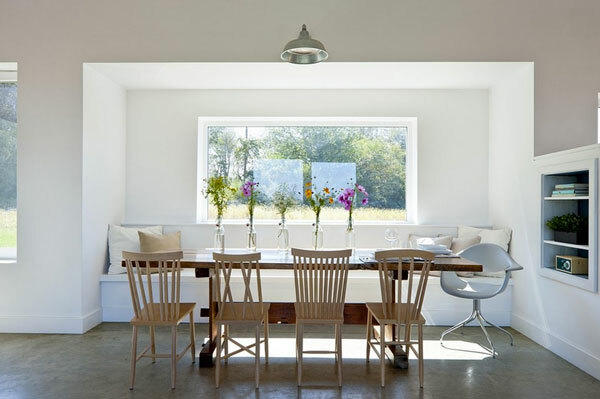 To help you recreate those summer days, kitchen nooks are great examples of how old and new can be combined to achieve something better than the sum of its parts. 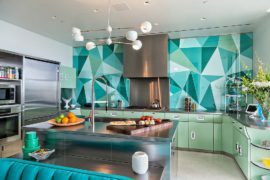 Below are some retro-modern settings that are sure to be the center of memories and laughter in your home. 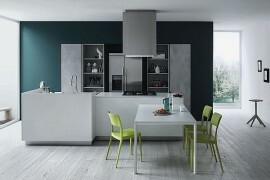 The interplay of complementary colors in the nook design above brings about an invigorating attitude. 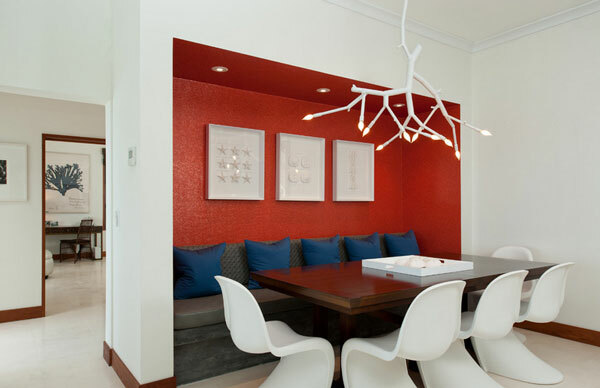 Inspired by the bold hues of the 80’s, this selection, with its leather upholstery and natural dining table, is a timeless design that exudes elegance and wit. 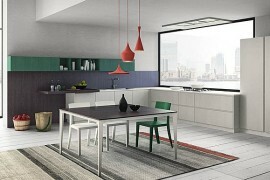 Just when you think you are done remodeling your dream kitchen, another idea pops up. 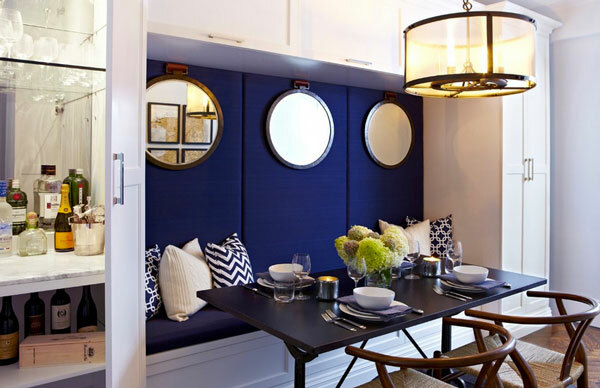 By blocking off a small area of the kitchen to install a lovely nook, you will not only make use of every amount of space in your home, but will also flex the boundaries of your decor creativity. 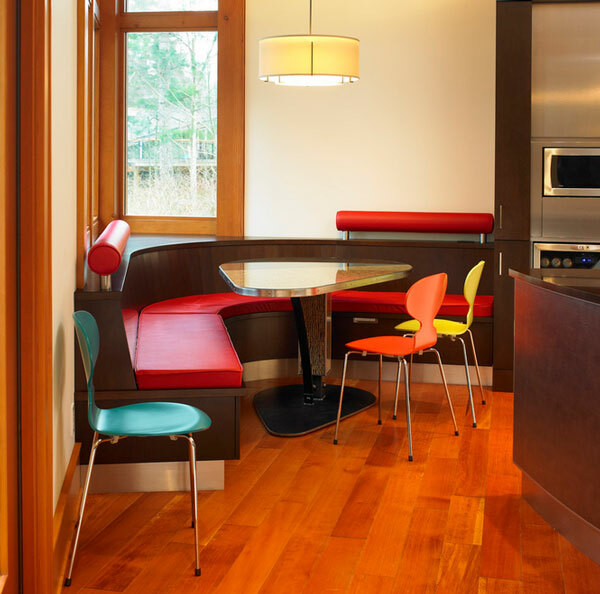 Bright colors in the kitchen can uplift the overall atmosphere, creating a humbling environment well-suited for quaint family dinners and bubbly dates at home. 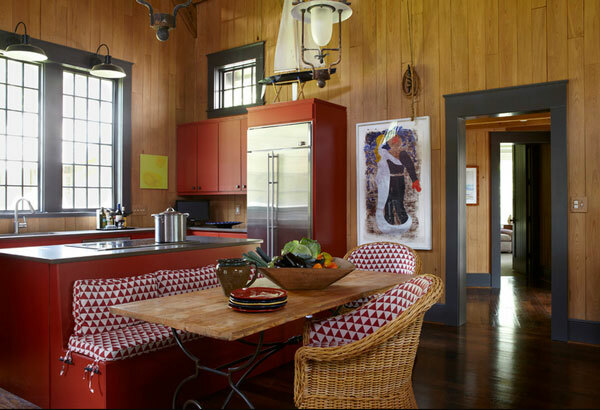 This citrus colored kitchen and stationed nook is my favorite. 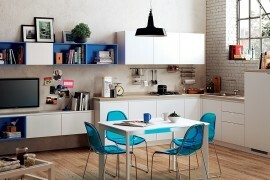 It is perfect for homes that feature a summery decor, and are adjacent to the warm, coastal breeze. 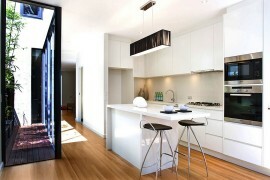 Enjoying time in this house and kitchen will feel like an ongoing vacation that is full of energy and life. Style uniqueness is a catalyst for unparalleled beauty. 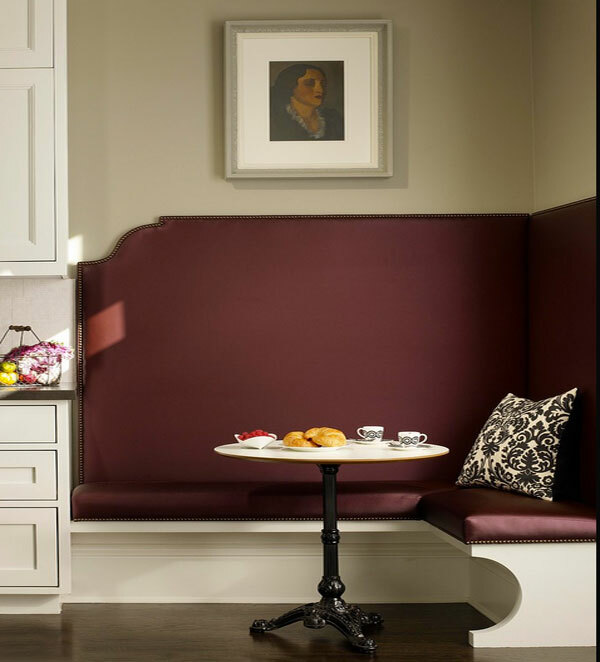 To take advantage of the independent charisma of kitchen nooks, you should see your nook as the crown jewel of your decor. 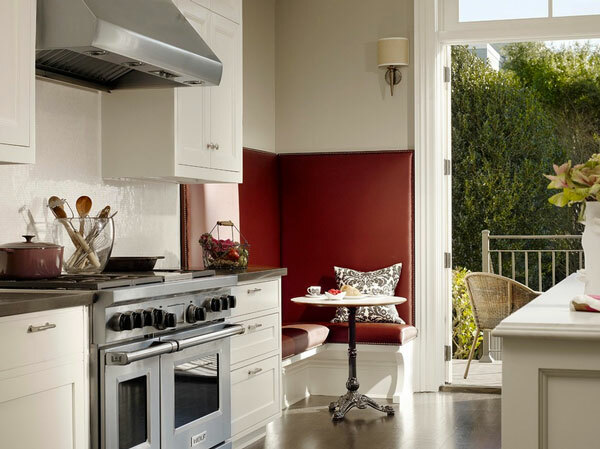 For homes that were built on the foundations of minimalism, kitchen nooks are the missing puzzle pieces that complete the picture of what a dream home should look like. 2014 is looking to be a year of eco-friendly designs and sustainable material usages. 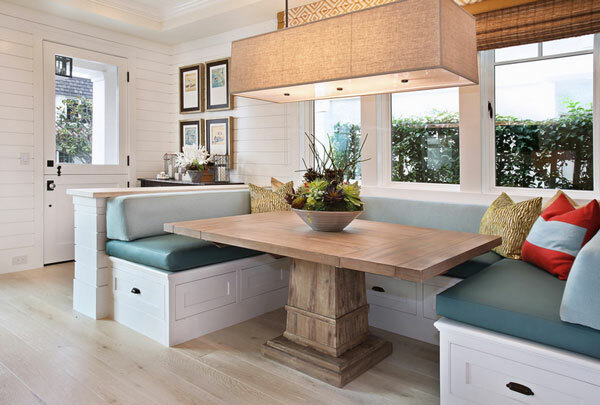 If you care about the environment and are looking to remove your carbon footprint, this wood bench nook design will meet your expectations! It’s hard to not give into the power and wonder of the color red. There is something unique about a burst of passionate color that ignites our senses and brings about an immeasurable amount of spirit. 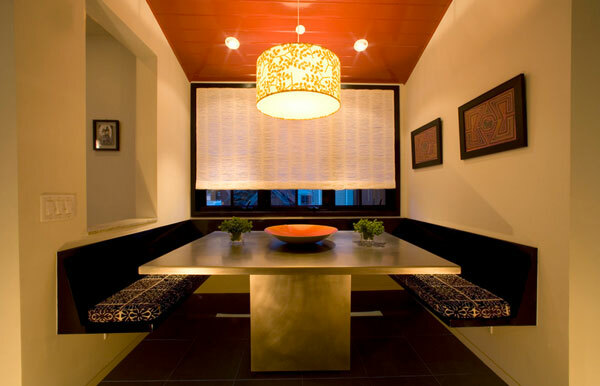 Dipping the kitchen nook in a bucket of fiery animation will not only bring out the vibrancy of the room, but will allow you to unleash your hidden appetite!